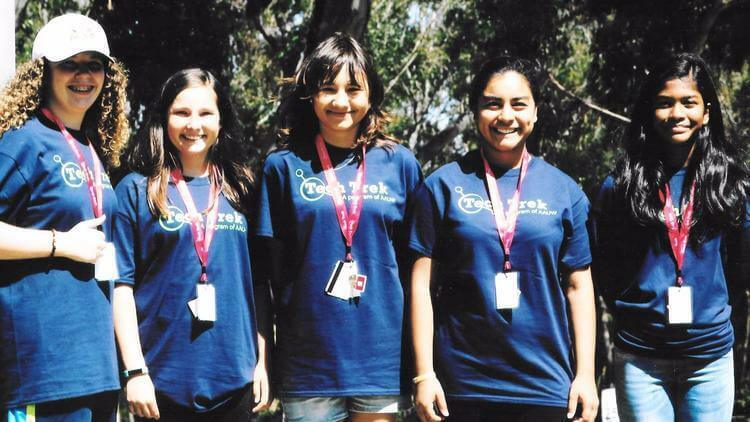 Incoming eighth-grade girls selected by the Rancho Bernardo AAUW chapter for this year’s Tech Trek were Raquel Kemper (Bernardo Heights), Peyton Mautz (Oak Valley), Karina Kukosyan (Twin Peaks), Chelsea Vizcarra (Twin Peaks) and Abigail Alvarado (Bernardo Heights). Five incoming eighth-grade girls recently gained new insights into the possibilities available through STEM fields during a special camp geared for them. STEM stands for science, technology, engineering and math, the focus of a weeklong camp at UC San Diego sponsored by the American Association of University Women. The San Diego Tech Trek camp was among eight held at college campuses throughout California this summer. The program began in 1998. The Rancho Bernardo Chapter of AAUW selected Abigail Alvarado and Raquel Kemper from Bernardo Heights Middle School in Rancho Bernardo, Peyton Mautz from Oak Valley Middle School in 4S Ranch plus Karina Kukosyan and Chelsea Vizcarra from Twin Peaks Middle School in Poway. The girls are typically recommended by a teacher and then go through an application process. Tech Trek combines classroom instruction with hands-on activities and off-campus field trips. The girls lived in the college dorms and were taught by women who are educators or working in STEM fields. It costs $900 to send each girl to Tech Trek. The fee for the girls selected by RB AAUW was paid by the AAUW chapter plus the Rotary Club of Rancho Bernardo and the Rancho Bernardo Sunrise Rotary Club, said Pat Armstrong, RB AAUW Tech Trek coordinator. She said in addition to the girls being encouraged to pursue STEM classes in high school and college and consider professions in those fields, the girls also learn self-confidence during the camp. Abigail “Abby” Alvarado, a 12-year-old incoming Bernardo Heights eighth grader, said because she is “really into science” she wanted to attend Tech Trek. One of the most interesting things she learned about were natural and man-made polymers, such as cotton, rubber and latex. “I knew they were in the world, but did not know they could be man-made or natural,” she said. Her main course was marine biology, which included dissection. “I’ve done a few dissections here and there (before), but they make me kinda queasy,” Abby said. Abby said because of Tech Trek she wants to take more science and math classes in high school. “I like chemistry,” she said. “My experience was pretty much fun,” said Karina Kukosyan, a 13-year-old incoming Twin Peaks eighth grader, who had anatomy as her main course. Karina said her field trips included seeing equipment at a medical college and visiting the Scripps Institution of Oceanography. Karina said she is really interested in robotics and is considering ways to get more exposure to possibilities in engineering or the robotics field.